Elsie and her kittens (see Asia) were rescued near a dumpster in Nashua, NH in June 1996. Elsie DEMANDS attention - if she can't get on your lap, she jumps onto your shoulders and rubs her face against yours. 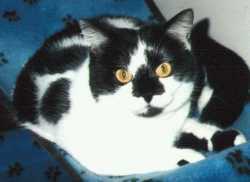 She became Patt & John's fourth 'Kitty Angel' in August 1996, when she was about 13 months old. 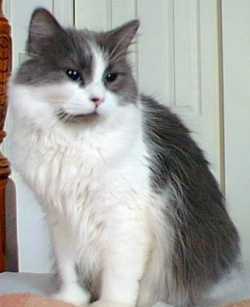 She was adopted at the same time as Tabitha and Tiffany. Tiffany was found outside an apartment complex at the young age of 7 months in June of 1996. Although a birth defect affects her eyes, she has the sweetest disposition of all the cats adopted by Patt & John. 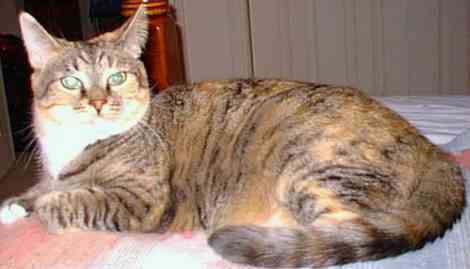 She became their fifth 'Kitty Angel' in August 1996, and was adopted at the same time as Elsie and Tabitha. 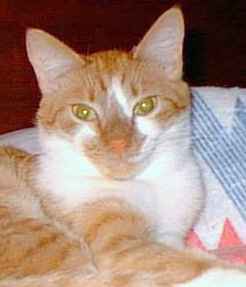 A sad update - Roscoe died June 24, 2001, from hypertrophic cardiomyopathy, a heart condition that difficult to detect until it becomes serious. Patt and John wrote, "He was a little guy who did things in a big way. We will sadly miss our 'cute little orange guy.'"